Dart's sophisticated manufacturing technology allows blocks to be custom machined in a production environment. 10 - 11.100" deck height allows use of long rods with stroker combinations. Raised cam location +.600" clears stroker crankshafts. oil pan rails spread .750". Accepts crankshaft strokes up to 5.500" for large displacement applications. 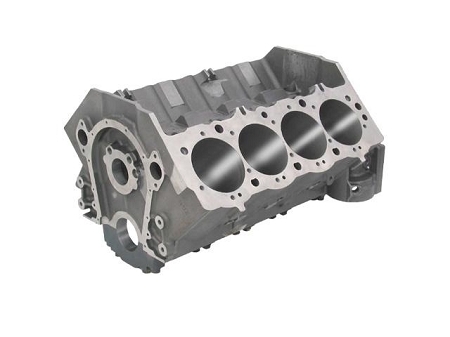 Four valley head stud bosses prevent head gasket failures with high compression ratios and/or nitrous oxide. Slotted bosses allow the use of studs instead of difficult to install bolts. True priority main oil system lubricates the main bearings before the lifters. Our stepped main oil gallery (9/16" to 1/2" to 7/16") increases the flow of oil to the crank at high rpm, and our front oil crossover eliminates internal oil leaks around the distributor shaft. Oil crossover located at the front of the block delivers maximum oil volume to the main bearings and ensures reliable lubrication for the lifters and pushrods on both cylinder banks. Steel 4 bolt main caps are manufactured in house by Dart to ensure quality and compatibility with the block. Three center caps have splayed outer bolts that anchor the caps to the strongest part of the casting, front and rear caps have vertical bolts for oil pan clearance. Rear main bearing cap uses a standard two piece crankshaft seal without adapters or crank modifications. This block weighs 300lbs and must be shipped via truck. Please call us at 305-893-5018 for a shipping price.